“Net Neutrality” is the principle that people’s connections to the internet are not blocked, throttled, or unfairly prioritized, coupled with transparency as to how the connections are made. Net Neutrality is not simply applying 1934’s Title II common carrier provisions to the internet we know and love today. It would be incompatible to apply regulations written before WWII to the continually evolving and improving modern network that is the internet. This issue has been the subject of FCC rulemakings, legal challenges, and legislative attempts at codification in various forms since 2004. USTelecom’s member companies support and adhere to net neutrality principles, and we believe modern rules for an open internet are vital for a pro-consumer, pro-innovation and pro-investment broadband ecosystem. In December 2017, the FCC adopted the “Restoring Internet Freedom” (RIF) order, reversing a two-year regulatory experiment to regulate broadband service like a utility under Title II of the Communications Act. 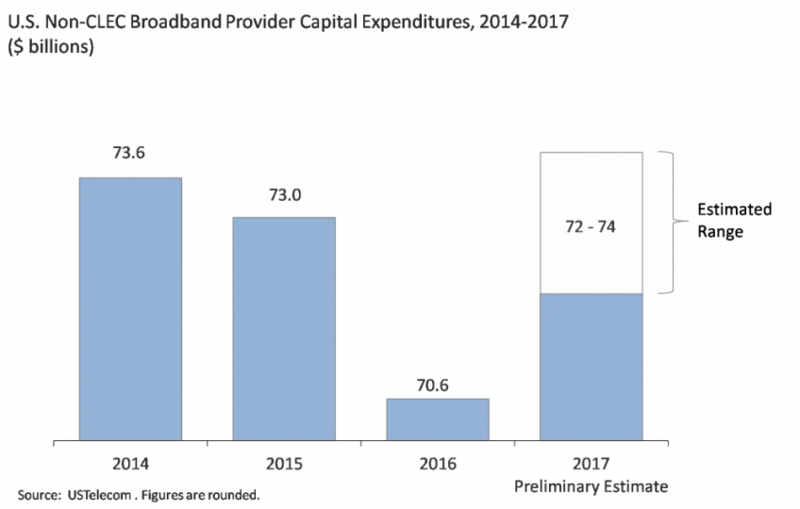 As pro-consumer policy incentives for broadband innovation and investment continue to take root, the two-year decline in private capital investment in U.S. broadband infrastructure from 2014 to 2016 appears to be in the rearview mirror, according to a preliminary USTelecom analysis of the 2017 capital expenditures of wireline, wireless, and cable broadband service providers. Title II-based net neutrality regulations increase regulatory burdens and erect financing barriers on small providers, constraining network development and expansion in rural markets. U.S. broadband companies, excluding independent competitive local providers and fiber operators, invested between $72 and $74 billion in network infrastructure in 2017, compared to $70.6 billion in 2016, showing at least an increase of nearly $1.5 billion. What can be done in the 116th Congress? A straightforward, enforceable, modern regulatory environment can ensure an open internet, while leveling the playing field so all online competitors have a fair shot and equal treatment.